THE MINIONS, as any fule kno are the ridiculously and surprisingly popular side-kicks of Gru, the star of DESPICABLE ME. 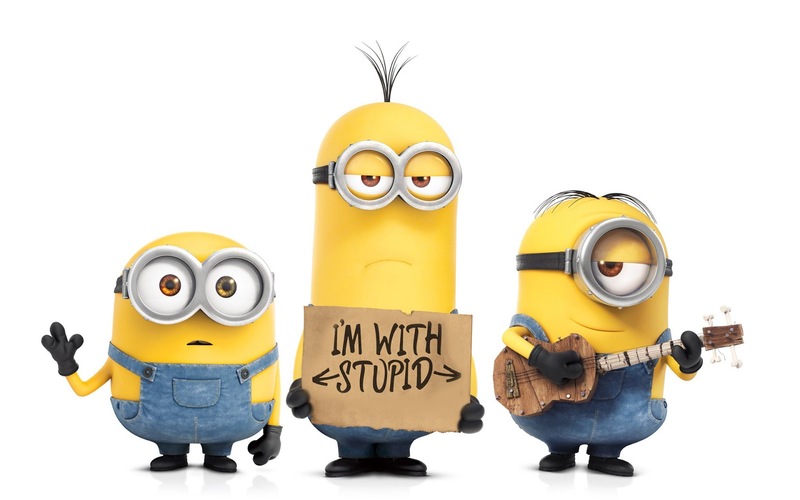 These yellow-bean-like energetic, gibberish-speaking cheeky chappies arguably already hijacked that franchise, as evidenced by the fact that they, not Gru and his daughters, were on most of the posters. So I suppose it was inevitable that we would get a spin-off. The fantastic news is that the movie more than stands up on its own two feet. Despite the quasi-unintelligible talk, we absolutely understand that our protagonists, Stuart, Kevin and Bob, are different personalities. This is more than helped by an hilarious deadpan witty voice-over from Geoffrey Rush (PIRATES OF THE CARIBBEAN) at the start of the film. We open with a natural history of the minions - starting as little amoeba in the opening credits - haplessly following whoever is the Big Bad of the moment, until the dinosaurs become extinct and they have to find evil men to follow. In classic minion style, their eagerness overmatches their competence and they end up stuck in an icy waste having followed Napoleon into Russia. At this point, the story truly picks up, with three minions going on an adventure to find a new evil henchman to follow. They sail to the USA and journey to Villaincon (a wonderful satire on the insanity that is Comicon) where they fall into the service of Scarlett Overkill (Sandra Bullock in a self-satirising villain role). I guess the moral of the story is be careful what you wish for - and through a series of accidents Bob becomes king of England, and then has to rescue the nation from Scarlett and find their new master on the way. Kudos to co-director Pierre Coffin who also voices ALL of the minions - creating separate characters and also enough actual language that we can keep up with them. The movie has wit, a warm heart and is a worthy addition to the DESPICABLE ME world. There's nothing here not to like! 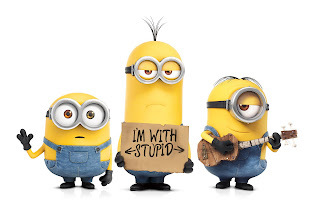 MINIONS has a running time of 91 minutes and is rated PG. The movie was released in June in Indonesia, Australia, Malaysia, Singapore, Armenia, Brazil, the Czech Republic, Croatia, New Zealand, Slovakia, Uruguay, the UK, Ireland and Poland. It was released earlier in July in the Netherlands, Sweden, Argentina, Austria, Colombia, Germany, Denmark, Israel, Estonia, Spain, Finland, Iceland, Lithuania, Latvia, Norway, Belgium, France, Iceland, Jamaica, the Philippines, Trinidad and Tobago, Azerbaijan, Bosnia & Herzegovina, Chile, the Dominican Republic, Hong Kong, Hungary, Jordan, Kazakhstan, Lebanon, Macedonia, Mexico, Russia, Thailand, Ukraine, Bulgaria, Canada, Cuba, India, Pakistan, Puerto Rico, Romania, Taiwan, the USA and Vietnam. The movie opens in Cambodia on July 14th, in Peru & Portugal on July 23rd, in Albania on July 30th, in Japan on July 31st, in Serbia on August 20th, in Italy on August 27th, in Turkey on September 4th, in Greece on September 25th, in South Korea on October 15th and in China on November 25th.